Do you have unsecured debts with a number of creditors you are unable to pay? If so, then there is an alternative to Bankruptcy, which allows you to renegotiate the terms of your repayments to creditors into an affordable and manageable sum. An IVA (Individual Voluntary Arrangement) can be used to help manage the debt, and lower your repayments to creditors, meaning you are able to pay off your debts while having enough money to live off each month. Why should you have an IVA? The IVA Proposal sets out the amount to be repaid and the duration of the arrangement which is usually 60 months, but can be much shorter if the offer is based on a full and final settlement. The IVA proposals need to be drawn up and presented for you by a licensed Insolvency Practitioner. This is because an IVA is a legally binding contract and is governed by insolvency legislation. IVAs are designed to clear your debts, whilst lowering your repayments to creditors or allowing you to offer lump sums from the realisation of assets of third party funding. The advantage of this process means that you are able to balance the desire to repay your creditors whilst having sufficient money to live off each month, thus avoiding the commonly seen patter of “robbing Peter to pay Paul”. Whilst you may not eventually repay your creditors in full – most people actually do not – your creditors will agree to write off often substantial sums providing you keep to your share of the bargain. This brings peace of mind in the knowledge that your debts are under control and that the arrangement is being supervised on behalf of you and your creditors by a suitably qualified and highly regulated professional. If you don’t take control of your debts your debts will take control of you. 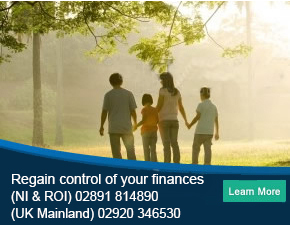 We can help you towards a debt free future, so take advantage of our free, confidential and insolvency advice and call us now on (NI & ROI) 02891 814890 (UK Mainland) 02920 346530 or enquire online. The insolvency experts at PJG Recovery deal with all kinds of personal and business debt, so we have the expertise needed to provide you with the best advice. Failure to adhere to the terms and conditions of your IVA may put your assets and home at risk. If your IVA fails your creditors can take further action against you and you may be at risk of Bankruptcy. For more information you can contact us about IVA's online or call us on (NI & ROI) 02891 814890 (UK Mainland) 02920 346530.